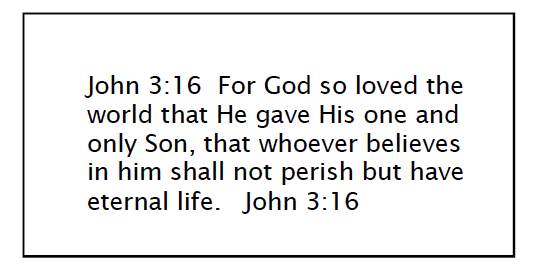 This is Page 2 of the Bible Memorization Online Guide. On page 1 we talked about WHY we memorize and looked at a simplified way to memorize Bible verses using the MemRead Memorization Method. If you are new to memorizing, I recommend you start off slow, memorizing a verse or two each week following the steps outlined on page 1 . If you are seeing results and wish to grow in your memorization skills, then by all means, you can come back here to page 2 to learn more. One last note before we get started. As I mentioned on page 1, the MemRead techniques that I am sharing with you have worked well for me. Having said that, these techniques may not necessarily work for you. I hope that they do, but there’s no guarantee that they will. The reason I like MemRead so much is that I have found that it’s easy to use, and I can tailor it to my own schedule, memorizing as little or as much as I wish. For me, time is a premium. I’m sure it’s the same for you. I want to be able to memorize more verses in less time and with less effort. And I find MemRead doesn’t require a big investment of my time. Spending just 2 minutes a day to work on a verse is pretty cool. I suggest you give MemRead a try and see how it works for you. If you find it helpful, great. If not, find another method that works for you or make up one of your own. The important thing is that you memorize Scripture and you use a method that works for you. Your goals is to memorize each verse “perfectly” meaning . . .
Let’s list each of the MemRead Steps here, and then we’ll look at each step in more detail. Step 1 — Pray for God’s help and direction. Step 2 — Select a verse. Step 3 — Write the verse on a card. Step 4 — Read the verse 10 times a day for 4 weeks. Step 5 — Test the verse for perfection. Step 6 —Record the verse. Step 7 —Review the verse periodically. Step 8 —Repair the verse as needed. The first MemRead step is to PRAY. Pray often. Ask God to give you a love for the Bible and a strong desire to memorize Scripture. Seek His direction on the verses He would have you learn, and regularly pray for His help as you memorize. As always, look to the Holy Spirit as your teacher and guide; He has much to teach you. After you pray, you will SELECT your verse(s). As you read your Bible and Christian books, and as you listen to the radio, Bible teaching, and your pastor’s messages, keep your eyes and ears open for new verses to memorize. Consider memorizing ones that God has used to teach you important personal lessons or spiritual truths. Another good source is a concordance, which lists, from A to Z, many of the words found in the Bible and gives you the chapter and verse for each. Check out the back of your Bible; some Bibles contain their own abbreviated concordance. There are also Bible computer software programs that allow you to do the same thing. My favorite Bible software is Laridian’s “Pocket Bible” ( http://www.laridian.com/ ), which works great on smartphones and pads. For PC users, they even have a desktop version. If you are new to memorizing, you’ll find the suggested Starter Verses on the the next page (Page 3: “Starter Verses”) helpful in getting your memorization program started. Possibilities List. When you come across a verse that you might possibly want to memorize one day, write it down and start a list (which you will call your Possibilities List). It’s unlikely that you will memorize every verse on your list, but it’s a good place to turn to when it’s time to choose new verses to begin memorizing. In addition to randomly selecting verses on any subject you wish, you can select verses that share the same word or the same topic. Let’s say you want to memorize verses on the topic of Jesus. 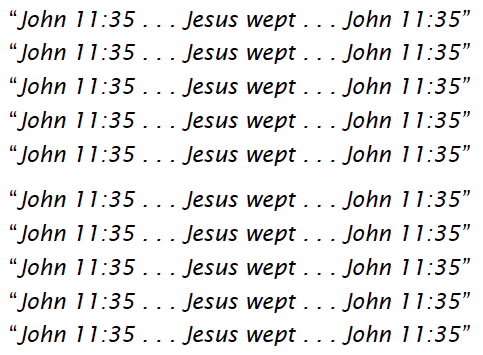 You would select verses from a variety of subjects within this same general topic, such as Jesus’ birth, life, miracles, crucifixion, resurrection, first and second coming, and so on. Which Bible version should I use? I suggest you memorize Scripture from the Bible version that you regularly read and study from. Make sure it’s a good one that you plan to use for years to come. One benefit of sticking with the same Bible version is that over time, you will read certain passages of Scripture over and over again. As a result of this repetitious reading (similar to the MemRead memorization method), you may find that you have memorized certain words and phrases without purposely trying to do so. Whether you choose one of these Bible versions or another, be sure it’s one that’s best for you. If you are unfamiliar with the different versions that are available, talk with your Pastor and other spiritually-mature Christians to get their input. Context—getting to know your verse’s neighbors. When moving to a new area, it’s helpful to check out the neighborhood and surrounding area to get a feel for the community. In the same way, when selecting a new verse to memorize, check out it’s neighborhood—the verses before and after it—to get a feel for what’s going on in the chapter. This will give you a better understanding of your verse in its proper context. You have prayed and selected your verses, now its time to WRITE them out on cards, which we call MemRead Cards. When do I write out my cards? Anytime you wish, but it’s best to be prepared in advance. Try writing out next-week’s cards this week. Where can I get these cards? Index cards are found in a good number of stores. For business cards, your best bet is your local office supply store. The business cards that I use are sold as packaged 8½” x 11” perforated sheets (10 cards to a sheet). 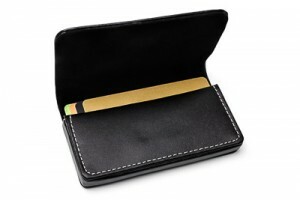 One package hold 25 sheets, which works out to 250 business cards per package. If you prefer typing out your cards on a computer using Word or Pages or some other software (instead of writing them out by hand), you’ll find these packaged business card sheets great to work with. They are designed to fit a printer’s paper tray, which simplifies the printing process. 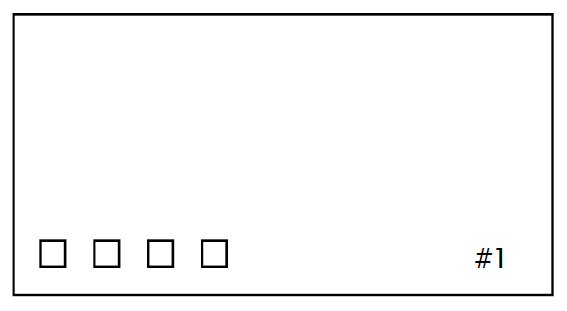 Writing out your MemRead Card. You will use both sides of the card. On the front, write out the verse and its address as illustrated below. When writing out your card, make sure you write each word exactly as it’s written in the Bible. If you write out the verse wrong, you will memorize it wrong. If you wish, you can also write in the words: Start and Finish at the top of the card, where you can later jot dot down the date of when you start and finish memorizing your verse. If you are memorizing a long verse or a passage of Scripture that takes up more than one card, use the same number for each card followed by a letter (1a, 1b, 1c, etc.). Optional. Feel free to change the look of the text on your card. With MemRead Cards, anything goes: highlighting, circling, bold type, drawings, italics, underlining, or whatever works for you. For fun, I will occasionally make a sketch or mark up my card to illustrate a point or to make certain words or phrases stand out. Being a visual learner, I find that marking up my cards helps me to better remember a spiritual lesson or truth associated with a verse. Again, marking up your card is strictly optional. Plain, one-sized print will do just fine. Tidbits. If you like, you can use the blank space on the back of your MemRead Card to jot down things you have learned from the verse and/or events going on in your life during your 4 weeks of reading. As you flip through your cards in the months and years ahead, these notes can trigger some special memories and reinforce valuable spiritual truths. So far you’ve prepared by praying, selecting your verse, and writing it out on a card. Now it’s time to start memorizing it. Again, as we have learned earlier, with MemRead you Memorize by Reading ; not by writing out words; not by repeating words or phrases over and over. At what speed should I read? At whatever speed you are comfortable with: slow, fast, or at your normal reading speed. When should I do my reading? Anytime you wish, but make every attempt to complete all 10 repetitions for a verse in one sitting. Focused reading. As you read your verse, be sure to concentrate on what you’re reading. Don’t just read the words mindlessly or daydream about other things: focus on the words. Focused reading gives you better results. I suggest you try each method of reading and see which one gives you the best results. For me, reading aloud is clearly the most effective. If your are not getting good, consistent results with whisper or silent reading, I recommend reading your verses aloud. For me, reading aloud works best. I find that I concentrate on the words of the verse better, and because I am involving more of my body parts (eyes reading, mouth speaking, and ears hearing), the reading seems to make a greater impression on my memory, and I learn the verse faster. The faster I learn a verse, the sooner you can do your daily repetitions without reading from a card. I can just recite my daily 10 repetitions from memory, while doing other things. Do I always have to read when doing my repetitions? No. As I just mentioned, once you can recall a verse from memory (without reading from your MemRead Card), your are free to recite your daily repetitions without having to read them. I love it when I get to this point with a new verse. Not having to read from your card can free you up to do your repetitions while doing other things. Rest day. During your 4 consecutive weeks of reading, it’s important that you take one day off each week as a rest day to refresh yourself. Which day of the week should I start my reading? Whatever day best fits your schedule. For many, Monday is best because it coincides with the start of their work or school week. With a Monday start day, you read your cards Monday through Saturday (6 straight days), and take Sunday off as your rest day. Mondays may not be the best start day for you. Choose a day that is. How many repetitions are needed if a verse or passage fills up more than one card? 10 repetitions. No matter how many cards or verses you are working with, you read each 10 times a day. If you are using more than one card for a passage of Scripture (multiple verses), be sure you read all the cards for that passage at the same time. For example, if you write out the passage like Philippians 4:6-8 (three verses) and it fills up two cards, read both cards together (one right after the other) when doing your repetitions. ­If you do, great. But don’t count on it. Your mind is actively engaged in the memorizing process, but it’s still too early to see much in the way of tangible results. Stick with the program as outlined. Remember the program is for 4 full weeks, not one. How many weeks does it usually take for a verse to be memorized? There’s no telling; every verse is different. Some verses come quicker than others. You may memorize one verse early in Week 4, another late in Week 2, and still another in the middle of Week 3. You just never know. I find that a verse comes to me in stages. During Week 1, I usually see little or no results. In fact, there are times during the first week when I wonder if I’m making any progress at all. But as I continue with my daily reading, little by little the verse begins to come together. At first, just a word or two becomes familiar, then it’s certain phrases. As I remain consistent with my daily reading, I find one day that I’ve got the verse memorized; I am able to recall it from memory without reading from the card. If I’ve memorized the verse before the end of the 4 weeks, can I stop with my daily repetitions? No, you must continue with your repetitions for the full 4 weeks. Stopping prematurely is a common mistake made by many new memorizers. Once they can recite a verse from memory, they may stop working on it, thinking they’re done. Then weeks or months later they can find themselves forgetting or mixing up the words to the verse. When this happens, some Christians become discouraged, conclude that they have a bad memory, and quit memorizing altogether. This is why it is very important that you continue with your repetitions for the 4 full weeks regardless of when you first learn a verse. The extra time and additional repetitions will help you with your long-term retention of the verse. “Short-Term”memorization. When you first memorize a verse, meaning you can recite it from memory without reading from the card, you have only reached the first stage—short-term memorization. Even though you may know the verse well, chances are you won’t remember it very long. It’s like a student who memorizes a bunch of information at the last minute and scores well on an exam. But test them on that same information six months later, and chances are they will have forgotten much of what they learned. That’s an example of short-term memorization. “Long-Term” memorization is the second stage of MemRead. It usually occurs by the end of the 4th week. When a verse reaches this second stage (and the verse is properly reviewed—as discussed later), the probability of retaining it for years to come becomes greater. Cementing Scripture in your memory. 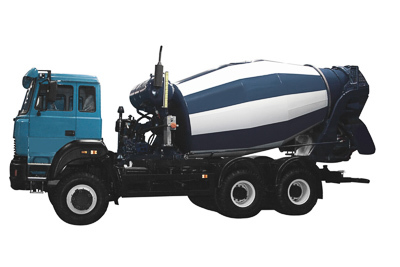 If you have ever worked with cement, you know that when it first sets, it’s still very weak. Tap it with a hammer, and parts of the cement can sometimes fracture or break off. It still needs additional time to fully cure and become rock hard. When you have first memorized a verse (short-term memorization) your verse is like freshly-set cement. The words are connected together in your memory, but the connections are very weak. The verse still needs additional time and repetitions (over the remainder of the 4 weeks) before the words become cemented in your memory (long–term memorization). How many verses do I start each week? That depends on your own personal goals and schedule. If you are a first-time memorizer, I suggest you start off with just 1 or 2 new verses each week and add to that as you become more comfortable with the process. If are an experienced memorizer, you can choose to be more aggressive. Experiment with 3-4 new verses each week and adjust that number up or down. Over time, you will discover the ideal number of verses that’s right for you. Aim to consistently average that number each week. 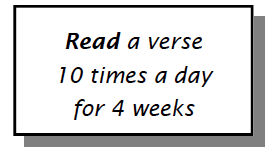 For example, you may set a goal of averaging 2 new verses each week. If you are too busy one week and start just 1 new verse, then try to make it up the following week by doing 3. If you do zero one week, go with 4 the next. Adjusting this way helps you to maintain your 2-verse-per-week average. 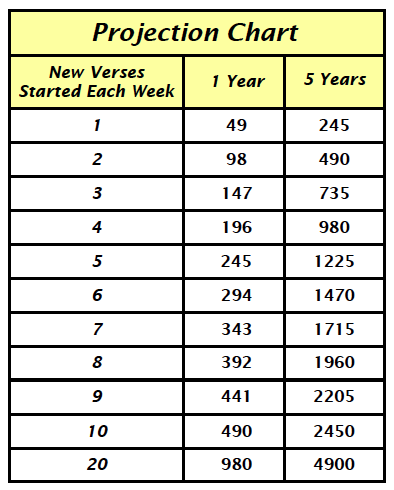 To estimate the number of verses that can potentially be memorized over a 1 or 5 year period, locate the number of new verses you’d like to average each week in the left column and then look to the right column for the1and 5 year projections. If you choose to be more aggressive and start 10 new verses each week, in one year your 490 verses will be enough to complete one of the following books (along with a few short Psalms and/or chapters). Early on, I wasn’t real big on setting goals or monitoring my progress, but over the years I’ve grown to appreciate the value of both. I have seen first-hand that when I have set realistic goals and measured my performance, I have been very productive. When I haven’t, my results have slipped. If you’ve never set goals and monitored your progress, why not give it a try? You may find yourself becoming more motivated and productive. ­­­­­­­­­­­Keeping your cards organized. When you first get started, you will be working with just one group of cards. Each week, thereafter, you will be adding a new set of cards until you reach a point where you are regularly working with 4 groups of cards. It’s important to keep each group of cards separate from each other, so that they don’t become mixed up. Now that you have completed your 4 weeks of reading, it’s time to TEST your verse to ensure that you’ve memorized it perfectly. If the verse passes, it graduates and you’re done! A passing grade is perfect; anything less fails the test. As we discussed earlier, a verse is perfect when . . .….. Taking the test. You can test yourself or have someone test you. 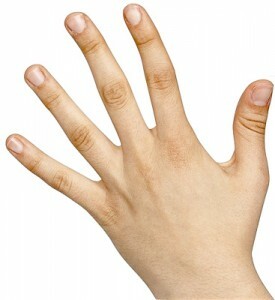 This is a “closed-book” test. No cards or open Bible should be within reading view. When testing yourself, recite the verse aloud. Make sure you can say it smoothly—with no hesitations. Next, write out the verse on paper along with its address. When done, use your Bible and check your results carefully to ensure perfection. If testing with someone, give them the card and recite both the verse and address aloud. Don’t let them help you should you make a mistake. They can point out any mistakes after you’re done. Have them comment on your delivery. Was it smooth? Any hesitations? If your verse fails the test, no problem; the verse may just be a difficult one. Simply read the verse for an additional week and retest it. If it passes, place the card in storage. If not, repeat the process until it does. Important Note: Even though the general rule is 4 weeks of reading for a verse to pass the test, there will be occasions when a verse requires additional reading time. If you are following the program exactly as outlined, the 4 weeks of reading is usually sufficient for most verses. A few failed verses now and then is okay. However, if your verses regularly fail to pass, consider increasing your daily repetitions for each verse to 12, 15, or whatever number of repetitions it takes to get them to pass within the regular 4-week time frame. We all learn at different speeds—some faster, some slower. Once you find the number of repetitions that gives you good, consistent results, stick with that number. Now that your verse has passed its test and is officially graduated, you will place the finished MemRead Card in storage and RECORD your verse in your bible. Be sure to keep your cards in numerical order using the MemRead Card #, which you have previously written on the back of each card. This will help you quickly locate your card at any time. Next, record the verse in your Bible by highlighting it with a marker or crayon. Jot down the date. Seeing more and more of your Bible marked up as memorized can serve to motivate you to want to memorize even more verses. Optional Tools: Over the years, I’ve used what I call a Verse Sheet to keep all my finished memorized verses together. You can do the same, if you wish. Using a blank sheet of paper (8 1/2 x 11), you can either write out or type your verses onto the sheet. Having all your memorized verses together on one sheet is kind of inspiring. It’s a sort of visible representation of what God, the Holy Spirit, has written on your heart. It can also serve as a helpful tool each month as your review your verses (we’ll cover this next). 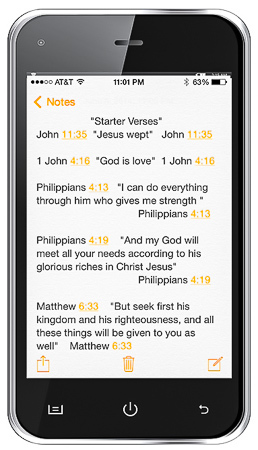 If you have a smartphone or pad that allows you to take notes, you can type in your verses there. This will give you access to your verses just about anytime, anywhere. Each month, you will REVIEW your old memorized verses to help keep them fresh in your memory. Why do I need to keep them “fresh” in my memory? Because as humans, we forget things, and memorized Scripture is no exception. If you don’t review your verses regularly, you risk losing them. Sharpening your recall. Memorizing a verse is one thing; being able to recall it quickly and accurately from memory when you need it is quite another. Reviewing your old verses regularly, helps you to sharpen your recall speed and accuracy. How do I review a verse? The same way you memorize a new verse—by doing multiple repetitions (reading/reciting your verses aloud, in a whisper, or silently to yourself). But instead of doing 10 repetitions each day to learn a new verse, you will do only 5 repetitions for the entire month to review an old verse. Striking a balance between memorizing new verses and reviewing old verses is important to your success as a memorizer. It’s great to memorize lots of new verses, but make sure you continue to regularly review your old verses, too. Over the years, as I was learning to memorize by trial and error, I didn’t always have this balance. In my quest to learn more and more new verses, I often neglected the review of my old verses. I wrongly assumed that because I had memorized my verses well, I didn’t need to review them very often. Big mistake. As a result, I lost a good number of verses, and to this day, I am working to relearn many of them. Don’t make the same mistake. Review your verses monthly to keep them fresh in your memory. As we all know, things break down from time to time and need REPAIR. Memorized verses are no exception; especially if they have missed their monthly reviews. If you discover that one of your verses is broken (meaning you are forgetting or mixing up words, or it takes you a long time to recall a verse from memory), you will need to repair it to its original “perfect”condition. This concludes our study of the MemRead Memorization techniques. If you are new to memorizing or an experienced memorizer looking for some good new verses to memorize, check out page 3, for a list of “Starter Verses.” Simply click on the link below to be taken to that page. You are also welcome to learn more about any of the following topics or to go to the Home Page by simply clicking on one of the other links below.